Michael from Stylish Fabric reached out to me to see if I wanted to try some of the fabrics from the shop. A quick look through their offerings turned into a deeper dive through all of the interesting apparel fabrics they have there… good stuff! Stylish Fabric provided me with the fabric for free, but all opinions are my own. 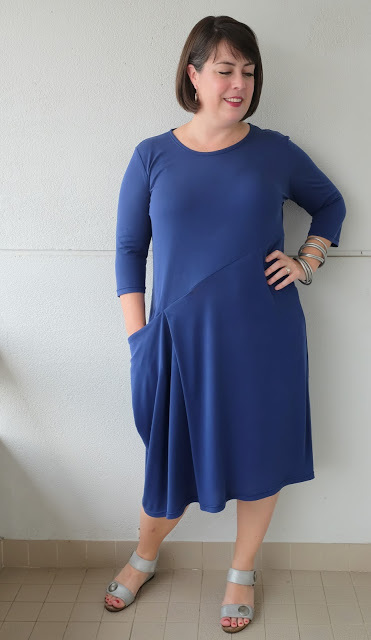 Ultimately I chose this deep blue modal poly sandwash cupro knit fabric, which is a lightweight jersey with a silky feeling, a matte texture, fabulous drape (see photo below!) and a bit of horizontal (but not vertical) stretch. Colorwise, it’s a rich and elegant blue that’s not quite a navy (there are several other lovely colors, too… the dusty pink and brick caught my eye). I found the cupro to be the teeniest bit sheer for an unlined dress (I’m ok with it, but I could see it bothering some people), but I think it’s definitely perfect for blouses. Stylish Fabric says, “this fabric breathes and regulates body temperature like cotton. Cupro is a hypoallergenic, antistatic fabric that is resistant to stretching out of shape at higher temperatures.” I was curious to learn a bit more about cupro, so I did some googling and found that it’s cellulose fiber, recovered cotton waste from the cotton linter, similar to rayon or Tencel (read more here and here). Pretty cool! I thought the cupro knit would be perfect for a pattern I had in my stash, the Alissa knit dress from Style Arc. 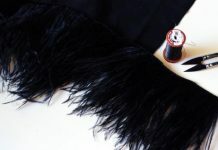 It has a cool diagonal waist seam and a funky, asymmetrical draped pocket. Style Arc calls it complex looking, but an easy sew. And Style Arc was right: despite the complicated looking pocket, this dress was a really quick sew. The front pocket/pleat situation is surprisingly simple, even with Style Arc’s minimal instructions. The construction diagrams in this pattern were very helpful in illustrating how to handle the pocket. I sewed up a straight size 16, which worked out great. I compared the sleeve to that on the Kim Swing top, and it was as wide as my altered piece from that pattern, so I didn’t end up doing a full bicep adjustment (yay!). The dress has some nice shaping along the center back seam so I didn’t end up with any swayback issues. I found that the cupro fabric was great for the Alissa because the lack of vertical stretch ensures that the weight of the skirt, with its extra drapey bits, doesn’t stretch out the bodice. I sewed the dress with my sewing machine because of some of the right angles at the waist seam, but ultimately finished the seams with my serger afterward. To stabilize the shoulders, I sewed a small piece of selvage from a previous project into the shoulder seams. I used a twin needle to sew the neck binding and hems. I am really delighted with this Alissa dress: the great fit, the funky pocket, the slinky, silky feeling of the fabric! I love it when a plan comes together, especially when it involves trying a new-to-me fabric! 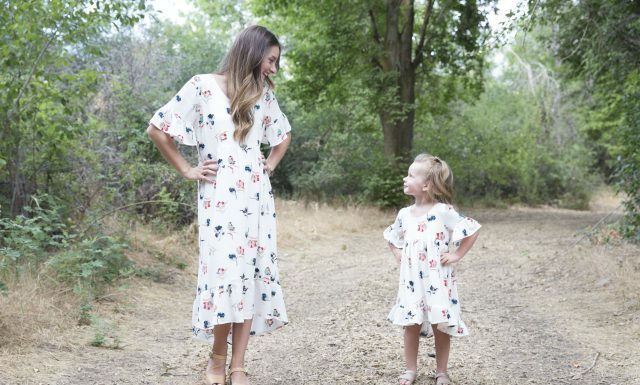 Lucky for you all, Stylish Fabric has provided a discount code in case you’re also interested in trying some of their fun apparel fabrics! Use the code “MEG” to get 15% off sitewide at Stylish Fabric for the next 3 days.